After 4 years locked away in white-painted, cinder block, high school classrooms, it is the moment you’ve been waiting for: Heading to college in the warm, tropical air of Miami, Florida. Those of us that did not grow up here remember the excitement of moving day. Experiencing the exhilaration of leaving behind your icy, snowy hometown, and prepare to embrace a new location, a new climate, and a new culture! While an individual’s favorite city is often a matter of opinion, CBS reveals that Miami is ranked number 5out of the top 100 cities in which to live. Considering the amount of cities in the United States, that is a hard number to beat! 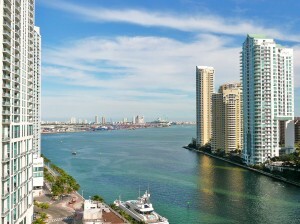 A great place to live, let’s take a look at what makes Miami anything but mundane. Just as we win with our location, we also win in the weather department. While your friends from home are singing the mid-winter blues, you and your roommate are enjoying sunny, blue skies and 70 degree weather – in December. Not to mention, you are a very short flight or cruise from the Caribbean, if you feel the need to escape for a weekend (but, why would you?). That being said, your friends will definitely want to come see you for spring break; no bribery needed! You get to play tour guide and show your old school mates around our inspiring town. Lucky for you, you will save the cost associated with traveling during spring break. It goes without saying that our mild tropical weather lends itself to numerous beach days. Feeling stressed in the middle of a semester? If you decide to attend school in Miami, a simple, short drive will lead you to the inviting shoreline. Enjoy the sound of waves rolling in to soothe your tensions as tides lap against the sand. Spend a relaxing few hours at the beach before heading to your biology lab. Your hometown friends will be extra jealous when they see your beachside biology study session on Instagram! The surrounding oceans, canals, rivers, and bays can also be educational! With 16 beaches from which to choose from, there is ample opportunity to feed your curiosity. Learn about ecosystems by snorkeling in our clear, calm waters. Lucky for residents, the Florida Keys are within an hour’s drive of many parts of Miami. Broaden the expanse of your knowledge at Key Largo’s Marine Lab, where you can learn more about the bountiful waters. Continue to enhance your learning with a visit to the Miami Zoo, or a trip to the popular Seaquarium. Your professors are sure to be impressed with the abundance of your knowledge. You’ve heard it before: Location, location, location! Miami is a short drive to the Everglades where students can learn about the nation’s largest national park, which also happens to be the largest subtropical wilderness in the country. Once in the Everglades, head over to the highly-ranked Royal Palm Visitor’s Center where nature is plentiful. You are sure to see several alligators, herons, turtles, and an astounding amount of other wildlife while walking the trails. Don’t leave the Everglades without booking an airboat tour, for a “fun and educational experience!” Not to mention, again, you are a very short flight or cruise from the Caribbean. Miami is a great spot for artists. Art has been part of Miami from day one. Creative thinkers and art appreciators alike have easy access to Midtown and Wynwood’s newly gentrified art district. Your inner hipster is probably very excited right now. All it takes is one look at the brightly colored, art covered city and you are bound to become inspired. Even when headed to the shore, the pastel Art Deco buildings surrounding South Beach are a must-see. Students can get a taste of this town’s history in an Art Deco walking tour. If you moved here from a small Midwestern town with only one dusty, brown road running through the center, then it’s time to really delve into America’s offerings. Rich and poor, young and old, you will meet every type of person centralized into one great metropolis. Open your eyes to the world around you and experience Miami for yourself. Not only are we well-rounded in age and earnings, but also in ethnicities. Rich in Latin culture (among many others), Miami is a great place to discover America’s diversity. Miami is bigger than it looks on paper, which means there are opportunities to learn about several cultures. Immerse yourself in another culture without leaving your city. Grab a tasty Cuban sandwich or a bowl of rich, filling paella while roaming the streets of Little Havana. Similar to the “Little Italy” or “Chinatowns” found across the states, Miami enables residents and visitors to experience a little bit of Cuba without ever stepping foot from our own soil. This is a learning experience in itself. No one wants to pack on the Freshman 15, but it is inevitable; you might as well embrace it! Explore Miami through your senses and learn about our thriving, lively culture in our top rated restaurants! Living in Miami without a car is completely possible, and even appropriate. To avoid rush hour traffic and to avoid the costs associated with driving a car (hello, insurance), catch a ride on the city’s Metro Bus. From there, students can ride the easily accessible, above ground metro train. Leading downtown with several stops along the way, the Metro is an excellent option for transportation. To help cut costs, our students are qualified to purchase a discounted Metro Pass, which allows unlimited access to Miami’s Metro bus and Metrorail for the entire month. If you have chosen to study in Miami, then congratulations and welcome! As you can see, Miami is the place to be. If you are interested in attending college in Miami, review the programs we offer at Florida National University, and apply today!